This excellent best-of tells this story, and it accurately conveys R.E.M. 's gradual evolution. 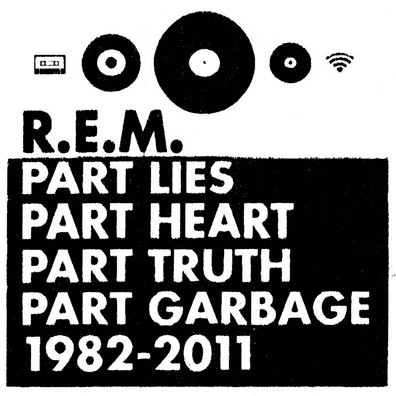 Though their sonic shifts seemed big at the time, Part Lies, Part Heart, Part Truth, Part Garbage, the band's first-ever career-spanning retrospective, proves that R.E.M. broadened their sound slowly over the years. This is a portrait of maturation, a chronicle of growth with arguably few missteps. The hits you know are here: "So. Central Rain," "Fall On Me," "Man on the Moon," "Losing My Religion." As with any compilation, the track list is imperfect—"Get Up" but no "Daysleeper"?—but R.E.M. was never about perfection. (Part Garbage likely refers to "Shiny Happy People" and "Stand," two hit singles the band has all but disowned.) Instead, R.E.M. was a band with a staunchly creative work ethic, constantly changing parts—electric guitars, mandolins, distortion pedals-while maintaining expertly crafted songs.